Inci Mehmet is a professional golfer, representing England at International level. 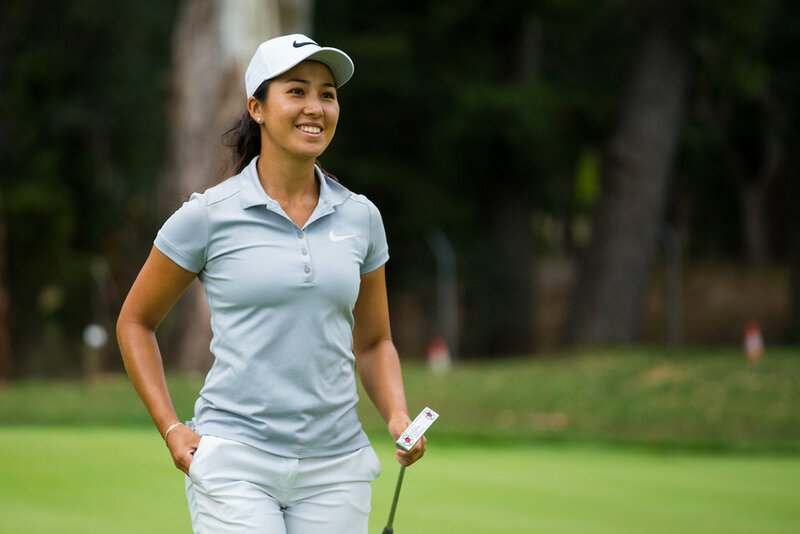 Inci is ranked #74 in 2017 Ladies European Tour Order of Merit Position and ultimately aims to earn a status on the LGPA Tour. She recently finished 2nd at the AXA Czech Ladies Challenge and played in the Ricoh Women’s British Open with a second round under par. Congratulations on turning professional and on your recent success at the AXA Czech Ladies Challenge and playing in the Ricoh Women’s British Open. Looking back, how did you get involved in golf? I picked up a club for the first time when I was four and I grew up being the only child. Golf was one of many sports I participated in growing up and I had always enjoyed being sporty and creative in general. When I was 10, I joined Royal Mid-Surrey Golf Club which is now my home club and I became obsessed with the sport. The rest is history! What if any changes have you made either mentally, physically, or both since becoming professional? Mentally I enjoy playing a round of golf every three holes at a time. Obviously, a round of golf consists of 18 holes, but more recently, I feel that playing 6 rounds of “three’s” have helped me switch on and off easier and keep focused, constantly set new goals but also restart after a bad hole for instance. That way, my goal is to shoot one under every three and if it goes to plan, I will shoot 6 under! Otherwise, because I am setting high standards for myself, I would not expect to shoot a high score. It is similar to “aim small, miss small” I guess you could interpret this as “Aim low, score low?!”. As you look back on your amateur career, do you have any advice to for amateur golfers who are aiming to turn professional? It is pretty cliché saying this, but you MUST enjoy it. If you intend turning professional, you must enjoy the journey and crucially understand that you are more likely to fail than succeed. Unlike a game of football where you have a winner and a loser, golf is a little different. In my opinion, you must always set yourself realistic standards and goals and work towards it. I live for the journey and I believe the results will come. What are you aspirations in golf for 2018 and beyond? Before my next season, I would like to finish my season on the European Tour as high as possible in the Order of Merit rankings, earn myself at least a full Symetra status in the States but ultimately earn a status on the LPGA tour. I have already qualified 1st stage last week and so I have two stages to go! Stage two will be in Florida, Mid October. Overall, my goal has always been to work towards being the best athlete, golfer and version as myself possible which I intend results in constantly competing and beating the other top golfers in the world. What motivates you to keep working on improving your game? Knowing that there is always someone out there working harder or smarter, it is a never-ending journey. But to me, the key word is “journey!” I am motivated to be living my best life, not allow myself to ever look back and tell myself “I could have/should have or would have done that differently”. Psychology is a growing area of importance in professional sport. Do you have any tips or strategies for how to improve the mental game of someone’s golf? Grow your knowledge and understanding for everything you do. What, why, how. Golf is not a game of perfect but it is massively a game of confidence. There is no right or wrong but if you are confident, you are more likely to succeed. You grow your confidence by seeing positive evidence and more often than not, that comes with good training and practice. Repeat, repeat, repeat! How important is physical training and nutrition in professional golf? Physical training and nutrition is a big part of why I love doing what I do. Being an athlete allows me to prioritise health to maximise my potential of competing at the highest level. I love being and feeling healthy as a result, it is very important! How did you hear about Beet It Sport? I have always known how nutritious beetroot is for your health. I believe it helps lower blood pressure and is a good source of minerals & potassium and so naturally, I came across Beet-it in health stores and through a few other golfers. I love snooping around in health stores, strangely I actually find it quite fun. Do you believe that consuming Beet It Sport improves your performance? Anything that can give you the edge or more focus certainly can improve your performance. I am excited to receive my months supply to give it more of a go, I will be a proper keen bean! Anything additional you would like to add about Beet It Sport? It’s great to be the monthly ambassador for Beet It Sport and cool to see the other sports professionals that see the advantage that the Beet It Sport range can have on performance.